Steve Lyons's past novels have typically featured humour on some level (the sole exception perhaps being Killing Ground). The Witch Hunters is however written with such a sobering style, attention to detail and accuracy of research that I kept needing to remind myself of the identity of the author. It is a book indisputably worthy of the late David Whitaker or John Lucarotti. Lyons has apparently effortlessly slipped back into the very early days of the series, where Ian and Barbara are still suspicious of the Doctor's motives, the TARDIS is consistently referred to as ‘The Ship’, Susan is prone to bouts of hysteria and the Doctor makes ill-conceived decisions which place his companions in peril. Perhaps most ill-conceived of all is allowing his friends to live in Salem Village for a while in the full knowledge of what will shortly occur there. 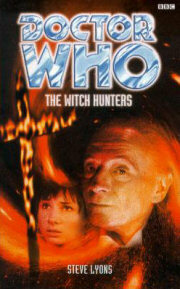 The time travellers soon arouse suspicion in the deeply religious villagers and ultimately lead to accusations of witchcraft, and its tragic consequences.